The Trump administration has released another variation of their long-dormant infrastructure plan. Just like the previous version, the plan amounts to empty talk. To understand why, one must examine the fiscal year 2019 budget proposal, released alongside their infrastructure proposal. While the administration trumpets an infrastructure plan, their budget radically cuts federal investments. Even their trumpeting of the stand-alone infrastructure plan is hugely misleading. Instead of the $1 trillion being claimed by the administration (already pared back from the $1.5 trillion they claimed they’d be investing in infrastructure in earlier discussions), the plan only calls for $200 billion in federal funds. Finding the rest of the $1 trillion will be left overwhelmingly to states and localities, despite the fact that they already bear the brunt of paying for public infrastructure spending. In total, state and local governments account for 77 percent of public infrastructure spending in the United States. They account for 62 percent of capital investment and 88 percent of operations and maintenance. It is odd to argue that the United States needs a substantial infrastructure push to deal with past underinvestment, and then to propose that the same system that yielded this underinvestment—relying too much on state and local governments—should just be continued. If we want a real investment in infrastructure, continuing to kick the problem to state and local governments won’t solve anything. The Trump administration will claim that their plans are different because they will leverage the private sector. This claim doesn’t change anything. Private entities will not build infrastructure for free, but will expect a return on investment. That means state and local governments will have to pay for the infrastructure with taxes, tolls, or other user fees. And if state and local governments predictably dodge the task of financing and funding projects directly, public-private partnerships come with their own set of problems, as natural monopoly characteristics can leave the private partner in a position to hike tolls and degrade service quality. Notably, the fiscal year 2019 budget appears to have gotten rid of one of the more egregious cuts in last year’s budget—at least on paper. Last year’s president’s budget would have starved the highway trust fund by limiting its spending to current baseline revenues. But because the trust fund is reliant on a dedicated tax—the federal gasoline tax— and because this tax hasn’t been increased since 1993, this meant trust fund spending would plummet. This year’s budget doesn’t raise the gas tax or identify any other funding source. But it does ignore the problem and pretends as if the trust fund will continue to be able to pay out money for infrastructure projects. The current trust fund gap is $138 billion, so almost 70 percent of even the meager federal commitment called for in today’s stand-alone infrastructure proposal would just fill an existing hole in future investments. The infrastructure plan is paid for by unspecified budget cuts. And whichever of the myriad cuts from the administration’s fiscal year 2019 budget is chosen would be disastrous. 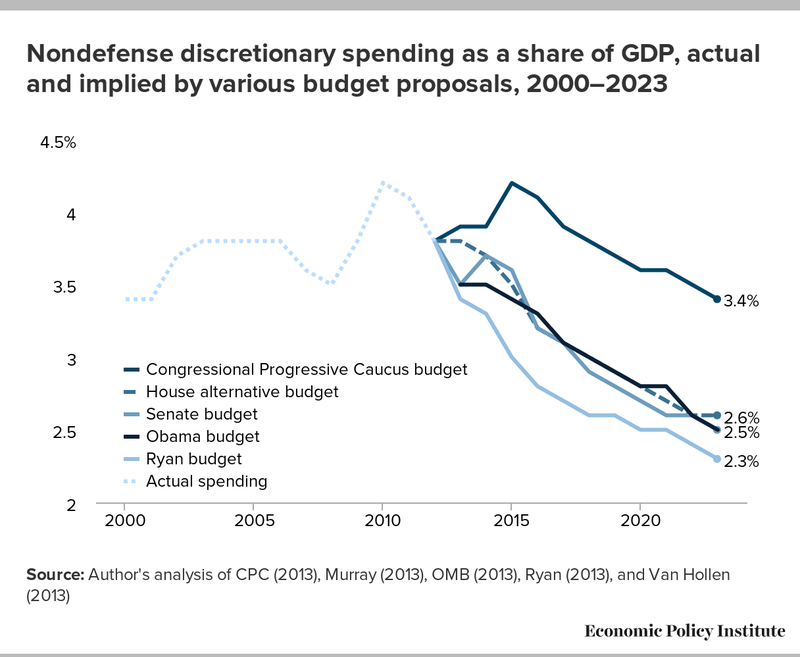 The vast majority of public investment is funded by the nondefense discretionary (NDD) portion of the budget. This year’s budget follows last year’s in gutting NDD spending and thus, public investment in the long run. Last year’s president’s budget called for NDD budget authority to reach an unprecedented low of 1.4 percent of GDP by 2027 (for historical comparisons, see here). The new budget follows in the previous budget’s path, and NDD spending would reach 1.3 percent of GDP by 2028. The administration’s fiscal year 2019 budget also offers up gutting of social programs as one of its cuts. The budget would cut the Supplemental Nutrition Assistance Program (SNAP) by $213 billion. The budget also includes large cuts to Medicaid and Medicare, though because it lacks necessary information exactly how large is unclear. On this, we shouldn’t be surprised if in the end it’s intended to look much like the House and Senate budget resolution’s from last year, which called for cuts of around $500 billion to Medicare and $1.5 trillion to Medicaid. The Trump administration’s infrastructure plan remains nothing but smoke and mirrors, with the addition that now it will be paid for by cuts to programs that working families rely on.